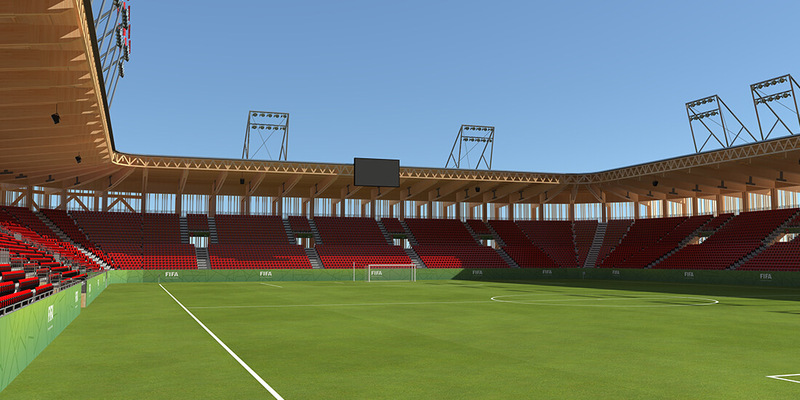 A rendering of a stadium constructed with Bear Stadiums and Rubner Holzbau’s modular wood systems. Courtesy Rubner Holzbau. Imagine a sports stadium that could expand and contract with its fan base and team’s fortunes, one that could pick up and move to greener (and more lucrative) pastures. Given team owners’ history of playing fans against each other, making stadiums more mobile isn’t likely to give pennant-wavers a sense of security, but the concept is an incredible breakthrough for building technology. 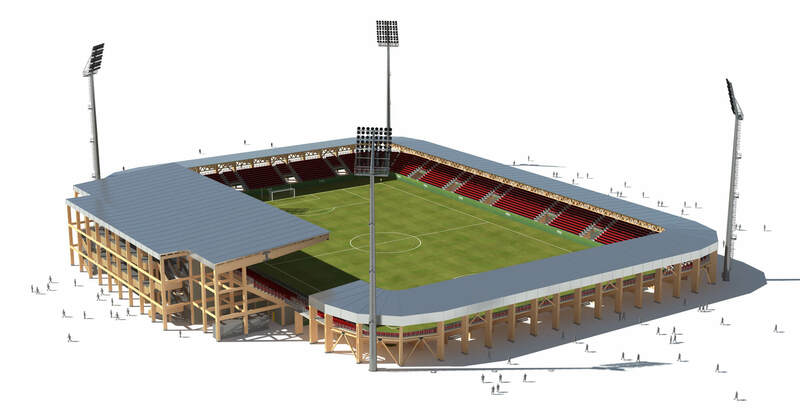 Endlessly modular and made of ultralow-impact mass timber, this vision of low-carbon construction, conceived by engineered-wood manufacturer Rubner Holzbau and prefabricated stadium designer Bear Stadiums, could soon materialize at a soccer pitch near you. 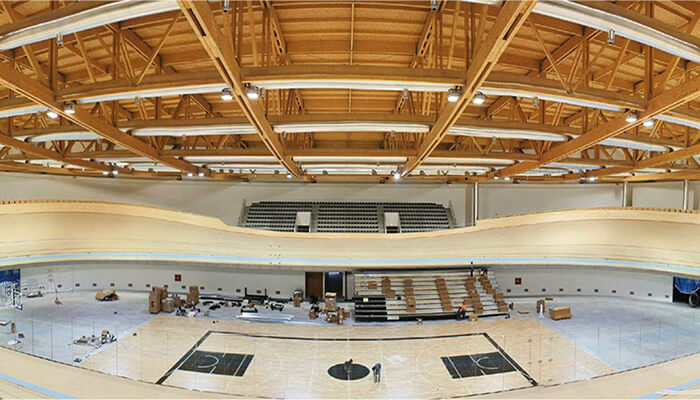 Bear Stadiums and Rubner Holzbau’s arenas are to be made of Nordic spruce fitted into glulam (or “glue-laminated wood”) mass timber, shipped to the location, and assembled on-site. These modular stadiums are small- to medium-size, 1,500 to 20,000 seats, with a full set of templates between these capacities. Both companies are based in Italy and envision that their first arena projects will be soccer stadiums; however, they anticipate that many outdoor sports, such as rugby, cricket, and baseball, could be accommodated. 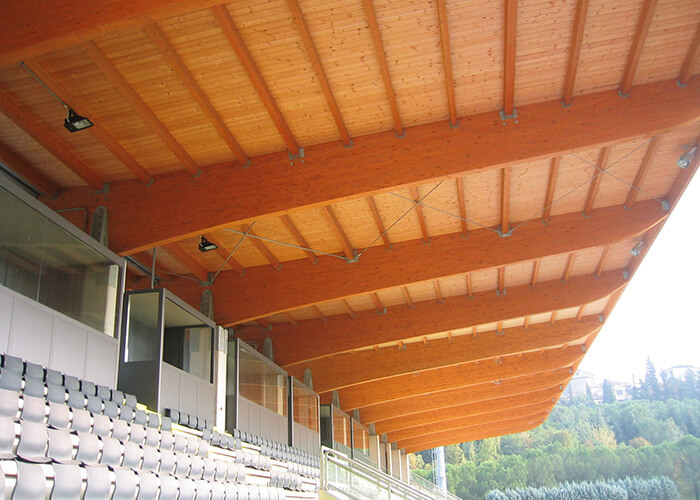 Rubner Holzbau has already constructed numerous large-scale wood stadiums and other structures, ranging from agricultural buildings to infrastructure facilities, across Europe. The roof of Portugal’s National Velodrome at Sangalhos, Anadia was completed in just 18 weeks. Courtesy Rubner Holzbau. Like all mass timber, fabricating this glulam system generates few greenhouse gases, and its primary material—wood—sequesters carbon. “The forest does not require any [external] form of energy to grow,” says architect Jaime Manca di Villahermosa of Bear Stadiums. Villahermosa envisions solar panels and wind turbines making these modular stadiums nearly carbon-neutral when not in use (notwithstanding the intense lighting requirements of game days). This emphasis on sustainable building practices aligns with the UN Climate Neutral Now initiative, which the FIFA organization has joined, committing to becoming climate-neutral by the latter half of this century. Glulam is a type of composite engineered mass timber comprising individual strips of wood glued together with grains running parallel. More established in Europe than in the United States, mass timber can offer shocking strength-to-weight efficiencies, even compared to steel and concrete, allowing for ever-larger and taller buildings that require less carbon to produce and build. Glulam structures, for example, can be pound-for-pound stronger than steel and two times lighter. Bear Stadiums and Rubner Holzbau’s modular wood systems can be scaled to accommodate a range of capacities; this rendering depicts a 10,000-seat structure. Courtesy Rubner Holzbau. 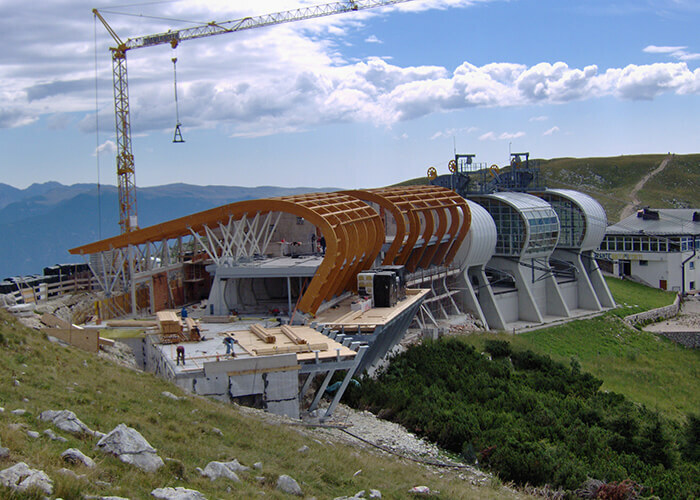 Glulam is notable for its ability to bend and curve when stressed, which can be employed to create an aesthetic flourish—or, more practically, the extra flexibility can absorb the destructive forces of earthquakes and other disasters, allowing the structure to bend without breaking. “Since glulam is an extremely elastic material, which is excellent in earthquake-prone areas, you also have to make the structure rigid by using these diagonal trusses,” Villahermosa says. Bear Stadiums and Rubner Holzbau are fielding interest from soccer clubs in Italy’s top two leagues, Serie A and Serie B. They also envision a global market for these buildings, especially applicable to modest budgets in the developing world. The per-seat costs of this system are projected to be lower than traditional stadium construction, and much of the labor can be done by unskilled workers, though 10 percent of the workforce will require specialized knowledge in modular wood construction. Smaller stadiums can be put together in six to eight months; larger stadiums might take nearly a year. The San Marino Stadium multipurpose stadium in Serravalle, San Marino. Courtesy Rubner Holzbau. And while these stadiums offer a truncated construction timeline compared to traditional models, they still offer a full suite of amenities for teams and fans. The largest stadium designs spread these across three levels: locker rooms, team offices, and an infirmary on the ground level; hospitality spaces (concessions, bars, and restaurants) on the second level; and sky boxes and exclusive suites on the top level. Throughout, the interiors are conventional, shying away from the trendy “all-plywood everything” interior look popular with the Dwell crowd, despite its earthy emphasis on the wood-based construction. This modular system means that these stadiums can occupy a middle ground between permanent and temporary. The structural elements are guaranteed for 50 years, Villahermosa says, longer than many stadiums of any sort last. But, “[They] can certainly be dismantled and rebuilt elsewhere, which means that they can serve as both permanent and temporary structures,” he says. Much of this durability is related to wood’s unique properties. Because it doesn’t expand and contract in response to temperature changes as much as steel, it’s easier to waterproof and seal. And wood doesn’t absorb and radiate heat like structures made of concrete (a “roasting stone,” Villahermosa says) or steel (“roasting on a BBQ grill”), which is especially helpful for outdoor venues that invite patrons to sit in the sun for an entire afternoon of sport. The structure surrounding the cableway on Italy’s Lake Garda was designed to be harmonious with the surrounding landscape. Courtesy Rubner Holzbau. The modular stadium design’s fundamental, indivisible unit is a 6-meter (approximately 19.5-foot) section containing 36 seats. This modular unit size is determined by the constraints of shipping containers: Two sections fit into one container. Most sections of these stadiums, aside from the main “stem,” which houses much the nonseating infrastructure, can be added and subtracted to with this individual modular unit. A common complaint lobbed at sports stadiums is that they cost many millions and sit unused for vast swaths of the year. But this new kind of modular flexibility hints at multipurpose stadiums that can serve more events. Maybe the next generation of sports stadiums can double as a festival marketplace, concert venue, or outdoor exhibition space during the off-season; less a hallowed temple of sport and more a casual and mutable community resource.